Tuesday June 14th 1898 I ironed and baked this morning. Will was at work in the garden. After dinner I started to go to town with him but found Father & Mother was at Aunt Libs. I stopped there. They came on down here to stay all night. Wednesday June 15th 1898 Mother and I were both busy with the work all forenoon. I went up to Murfords for plants as they went home and stopped at Aunt Ellens. there was a lot of the girls there. Charlie come after me and we went on down to Sandtown and I got a little girl to help me with the work. We put out the cabbage plants. weather quite cool. 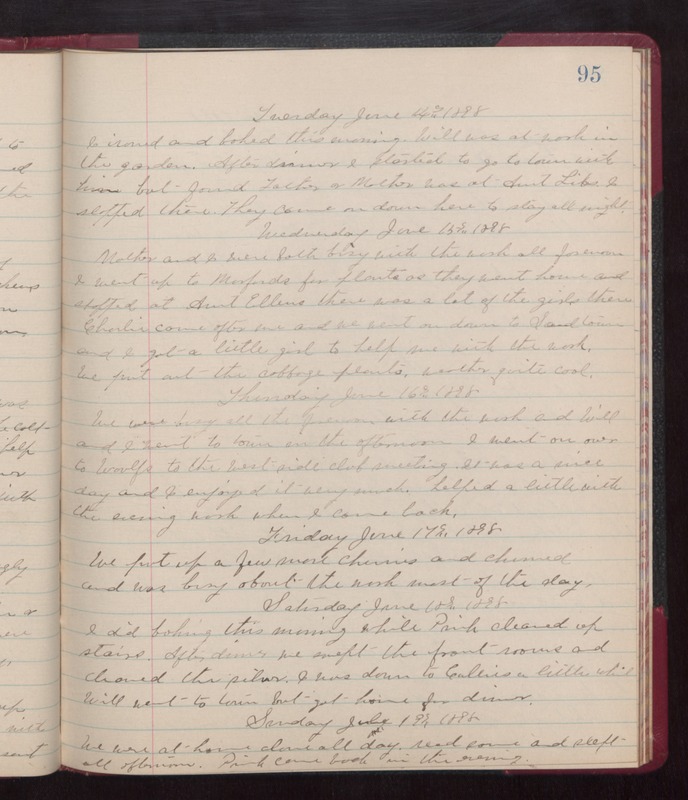 Thursday June 16th 1898 We were busy all the forenoon with the work and Will and I went to town on the afternoon. I went on over to Woolfs to the west side club meeting. It was a nice day and I enjoyed it very much. Helped a little with the evening work when I came back. Friday June 17th 1898 We put up a few more cherries and churned and was busy about the work most of the day. Saturday June 18th 1898 I did baking this morning while Pink cleaned up stairs. After dinner we swept the front rooms and cleaned the silver. I was down to Callies a little while. Will went to town but got home for dinner. Sunday June 19th 1898 We were at home alone all day. read some and slept all afternoon. Pink came back in the evening.